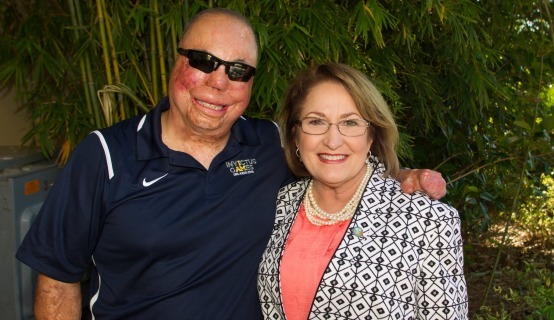 Orange County Mayor Teresa Jacobs proudly showed her support for wounded warriors from all over the world as a guest for the Opening Ceremony of the 2016 Invictus Games at the ESPN Wide World of Sports Complex in Orlando. The ceremony, on May 8, featured His Royal Highness Prince Harry of Wales, First Lady Michelle Obama, President George W. Bush, Morgan Freeman and musical guests, including James Blunt, Laura Wright and several military performances. The ceremony kicked off the Games, which continue through May 12. This year, two Central Florida Wounded Warriors will be competing as part of the U.S. Team. Michael Roggio, retired Petty Officer 3rd Class from the U.S. Navy, will compete in the swimming competition. Roggio’s hometown is New Smyrna Beach and he currently lives in Oviedo. Javier Rodriguez, retired Chief Petty Officer from the U.S. Navy, is from St. Cloud and will compete in wheelchair basketball. Rodriguez enlisted in 2002 with the desire to serve his country and see the world. He served aboard several submarines and a variety of naval bases. In 2011, he was the victim of a hit-and-run accident. Rodriguez sustained severe trauma to his lower extremities and battled through extensive surgeries and physical therapy before ultimately having his left leg removed. Before his injury, Rodriguez played basketball and volleyball in high school. Since participating in adaptive sports, he has competed in three Warrior Games; 2014 Invictus Games in London, 2015 Défi Sportif AlterGo in Canada, 2015 U.S. Volleyball National Championships and 2014 National Wheelchair Basketball Championships. Rodriguez said participating in adaptive sports has been an essential part of his recovery. This year, Rodriguez is looking to take home a gold medal for the U.S. in wheelchair basketball. He hopes his drive and passion for adaptive sports will inspire other wounded warriors as well. The Invictus Games is the only international adaptive sporting event for injured active duty and veteran service members. The Games use the power of adaptive sports to inspire recovery, support rehabilitation and generate a wider understanding and respect of all those who serve their country, as well as their families and caregivers. More than 400 competitors from 15 countries will compete in 10 adaptive sporting events. Tickets for the sporting events and closing ceremony may be purchased at invictusgames2016.org/tickets/. Photos from the opening ceremony may be found on Flickr for use by the media.